Originally from Columbia, Maryland, Emily is a Junior majoring in Computer Science and minoring in English. When she’s not studying, she likes to read comics and mysteries and work on her blog. I decided on my major my junior year of high school, and I’ve never switched, thanks to a very dedicated high school Computer Science AP teacher. I’m most interested in cyber security as a CS student, since I think it has become the newest threat to our way of life, and people working in that field will have a large part in defining the future of technology. Are you part of any labs, clubs, or organizations on campus? I’m part of a couple of on-campus clubs, most predominantly the CWIT Scholar community and Intervarsity Christian Fellowship. I’ve had two summer internships – one at Goddard Space Flight Center, and one with Booz Allen Hamilton. My internship at Goddard Space Flight center was the first time I had worked in a professional environment. The opportunity allowed me to really explore what possibilities were available for engineering students, as Goddard has jobs for any and all STEM fields. My experience at Goddard helped me see that Computer Science majors can be used for almost any project, and taught me to explain my work to someone without a programming background, since my boss was a physicist and not a computer scientist. My favorite thing about Goddard was that the project I was working on was a personal research project, but it was a research project that was not necessarily designed for Computer Science and therefore I did not continue to work at Goddard the following summer, as I hoped to find a job that applied my particular field. My internship at Booz Allen allowed me to really experience working in a team, as I worked with seven other interns on the project. While at Booz Allen, I learned a new programming language and learned a lot about the design process for software, since we were building a prototype of an automated testing suite. While I really enjoyed my experience at Booz Allen and would consider working there post-graduation, I decided to try some other experiences this summer. What are your plans after graduation? Are you thinking about Graduate School? As soon as I become eligible, I plan to apply for the five year combined BS/MS program. A job that allows me to work with talented engineers. UMBC was not initially my top choice, since I’d heard the rumors that it was a ‘suitcase school’ and a ‘dead campus’, and it was larger than the size I had wanted. However, after several visits, I learned that UMBC is a large school that gives the illusion of a small one. This illusion comes from the campus itself, since the majority of the buildings are contained inside Hilltop Circle, and from the various smaller scholar communities. 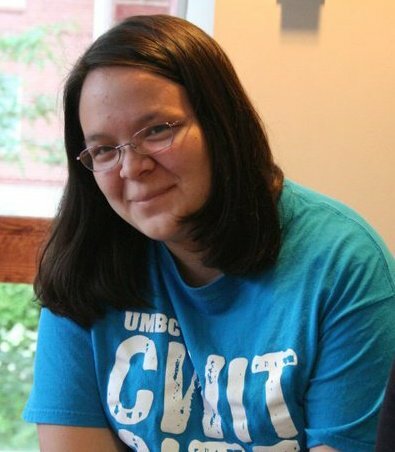 When I was accepted to the UMBC Honors College and the CWIT scholars program, I realized that my relationships with my professors at UMBC would be much closer than I had initially anticipated, and that I would be able to meet other students with my same interests through these programs. I love attending the different arts events on campus. Most weekends there’s a performance my friends and I can attend – a Cleftomaniacs concert, or a great play at the UMBC Theater. In addition, the Student Events Board (SEB) hosts tons of activities on all days of the week, including weekend movies. Living on campus makes the non-residential side of UMBC comfortable. My first CS course at UMBC was CMSc 201. CMSC 341H with Dr. Tim Oates has been my favorite course so far, for a couple of reasons. First, because I had a great professor who made things super clear and interesting, but second because the Honors designation ensured the class was smaller and more dedicated, which I really liked. If at all possible, I’d definitely recommend that students take honors CS courses (you don’t have to be in the honors college to take them). The department contacts its students often with great opportunities and news of general interest. Undergraduate students are always informed of the colloquiums hosted by the department and are always invited to attend. Interesting news is frequently shared on the myUMBC page, and in general the CSEE department is very good at communication. In my experience, all of the professors in the department are easy to contact, willing to help, and super personal. I’d advise incoming female students not to write themselves off – advice I often need to take myself. In a field like this one, where guys tend to dominate, it’s easy to feel alienated, but the professors in the department make an effort to not alienate you and I think it’s important to remember that you can be, and are, just as successful as your classmates. In general, I’d advise future students to take advantage of the resources on campus – the Chemistry Tutorial Center, the Physics Tutorial Center, the SI tutoring for CS classes, the Math Lab and the Writing Center – everything is designed for a student to succeed, so you should never feel like you have to study alone.